For the last few years, a good buddy and I have been travelling to Montreal, Canada, a city that we have fallen in love with for its walking neighborhoods, the quietness of a metropolis, the outdoor cafes and restaurants, the beautiful sights of cathedrals and wide esplanades, the carefree Jazz festival, the air of French sensibility without having to cross the Atlantic, and finally the wonderful cuisine that tantalized us during each visit. This francophone city boasts nearly as many restaurants as the top contender, New York City. Here is a list of eating establishments that we have visited and are worth mentioning. 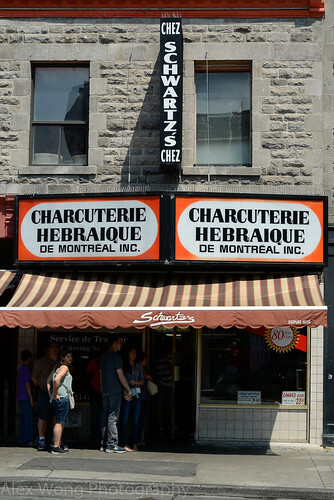 On our last trip last week, after getting off the plane and dropping off our bags at the hotel, we immediately made a bee-line to the Le Plateau-Mont-Royal neighborhood, specifically to Rue Prince Arthur, a pedestrian street lined with open air eating establishments. Here you are able to find local Greek restaurants offering great lunch deals, four-course lunches for around $15. 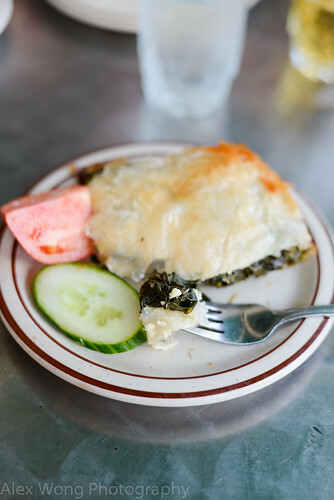 On one visit (usually more than one is paid), my starter was a generous piece of Spanakopita pie consisting of light and flaky filo dough interspersed with some crumbly feta cheese and spinach filling made savory from some enigmatic Greek spices; my friend’s lentil soup in another establishment was his favorite starter. 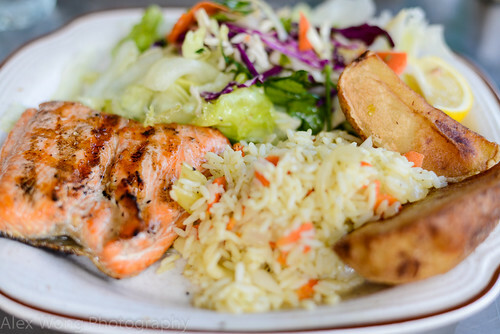 My main course (not entrée – here it means appetizer) was a plate of well-seasoned rice, a tasty and well-dressed Greek salad, some crispy wedges of potato and finally the main star, a healthy piece of grilled salmon steak, moist and perfectly cooked. 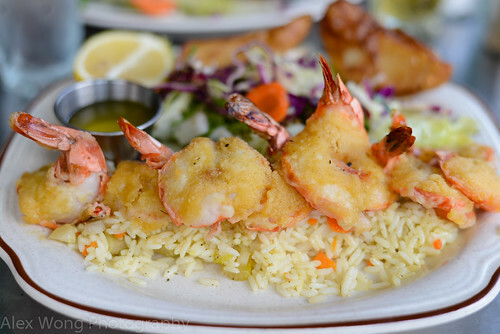 My friend’s portion of butterflied shrimp was tasty but the breading was off-putting to him; he prefers plain grilled shrimp which he has had before at another establishment that has, unfortunately, burned down. Usually a slice of moist cake and coffee or tea are the remaining courses to the long lunches that we relish in. I would recommend both La Caverne Grecque and La Casa Grecque. A walk to the close-by Square Saint-Louis to look at the quaint French-style homes is our digestif from such a satisfying meal. A bit north of the same area, many Portuguese restaurants abound in this rather diverse neighborhood. 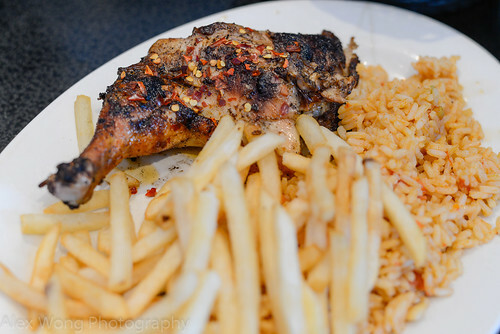 We met up with a Haitian-American Facebook friend who lives in this city, and he was dismayed when I had told him I had eaten in a specific Portuguese chicken joint a few year ago, renown for large quantities but nothing else. So, on this trip, he promised that he would take me to another that he particularly enjoys. Rotisserie Portugalia is a small corner establishment with a faded obscure sign which makes it a bit difficult to find. Entering the establishment is deceiving since all you see is a grill and a bar counter; however, the small dining room is at the back. Since the chicken is what this place is known for, my travelling buddy and I both got an order that came with a side of salad, rice, and fries. The sides were decent and tasty, but the attention-grabber was definitely the moist and well-seasoned chicken that was slightly smoky from being properly grilled and spicy from some chili flakes; even the breast meat was flavorful and not dry. My newly-met friend’s ribs were quite good but he said he had better on other occasions – sucking those bones clean sure was not a good indicator of slight discontent! 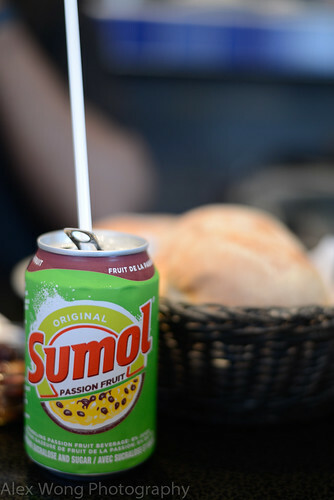 The perfect drink to wash all of this down was Sumol, a Portuguese fruity soda, of which the passion fruit version really hit the spot for all of us. 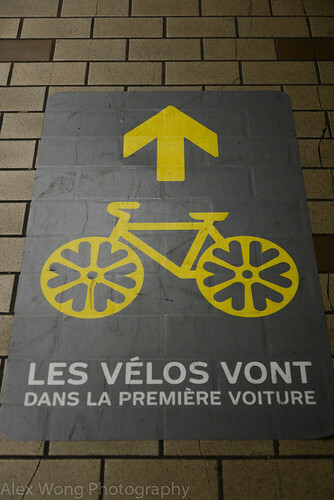 Thanks for the recommendation, mon ami! Everyone talks about this place – Schwartz’s Deli. It is located in the same neighborhood, and there seems to be a line of tourists waiting patiently to get in on any given day in the summer. I think the place garners more attention from the fact that Celine Dion’s husband bought this sandwich shop for $10m than the reviews of the sandwiches themselves. Since my buddy and I are not excited about Jewish deli food while in Montreal, we have never entered its doors; the long lines are not exactly enticing either. But all the guide books make mention of this place, hence my two cents worth. If anyone has gone in, please let me know! On a recent trip, a long-time Salvadoran-Canadian friend took my travelling partner and me to a French-style restaurant around the Le Plateau-Mont-Royal neighborhood. Les Infideles is located off the main St. Denis Boulevard but according to my friend, it is a hidden treasure without the stuffiness of fine dining. The complementary Carrot Soup set the right tone for the rest of the evening with its rich flavors from a good amount of pureed carrot and a full soup body that made this bowl tempting to be licked clean. My friend and I decided to opt for a couple of appetizers since they appeared very appealing especially during the warm week that we had there. The Smoked Fish Plate featured pieces of Trout and Salmon smoked a la minute with Hickory wood that made each moist morsel delectable. The Snails in Blue Cheese Sauce with Puff Pastry was definitely a la francaise with plump snails matched with a perfectly balanced sauce that could have gone overboard. My appetizer of Wild Mushroom tart was bursting with the wild boschiness and the slices of blue cheese sending out its slightly bitter tones, all napped by a rich demi-glace sauce that made this vegetarian dish truly satisfying. 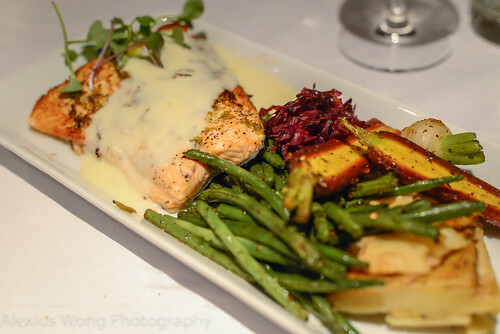 My host’s main course of Sauteed Salmon with Garlic Flower Sauce created enough envy to this reviewer’s eyes with the moist piece of fish coated by a rich sauce, accompanied by a bouquet of plump vegetables including the dual-colored carrot that made the dish visually tentalizing. 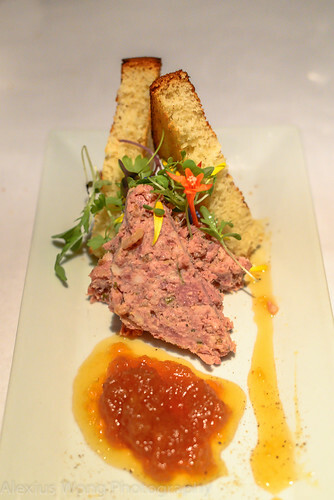 For my main, I choose the Pork Terrine and Peach Chutney which was completely up my alley with the mild and fresh-tasting chilled pressed meat well-matched by a fruity and sweet peach chutney and served with slices of rich Brioche bread. This place is well-worth the hike for its quality cooking, the value (especially for fine French cuisine), and the smart yet relaxed ambience (we complemented the waitress’s eclectic music selection). Another note: this place is BYOB, so stop for a bottle of your favorite vin on your way there. Further up from Le Plateau-Mont Royal neighborhood is the Jean Talon neighborhood which is renown for its large open market. This is where we headed one early afternoon to have lunch. Around the food court you will find different vendors serving a wide variety of cuisines, an indication of the influx of immigration to this part of Canada. 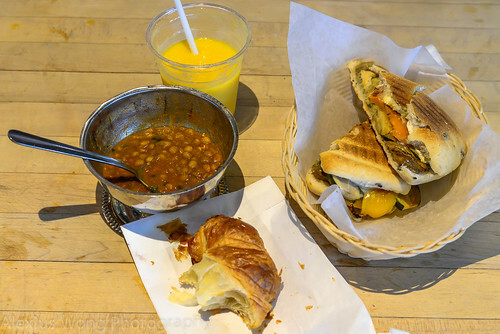 My friend had some Indian-styled lentil soup that was spiced by a touch of cumin, a rich buttery croissant, and a mango-orange juice smoothie to wash it all done. I had an Olive Ciabbata filled with roasted vegetables Blue and Goat cheeses that hit the right spots(when on a vegetarian mode) with the sweetness from the vegetables and the richness of the diary products (Brie is unpasteurized in Canada, compared to here, which tastes stronger and more bitter on the rind). For dessert, we walked around the fruits vendors and I sampled all the fruits a la Costco, enjoying all their fruity and sweet glory. We stopped by a vendor and ordered some rich Portuguese egg custard, Nata, and Macaroons that kept beckoning us to sample more unique flavors like Basil Lime. The Jean Talon Market is just off the Metro Jean Talon and worth an afternoon of gastronomic adventure. 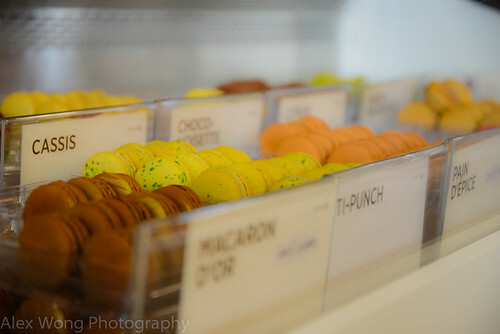 L’Academie has been a must-visit for all our trips while up in this Northern city. 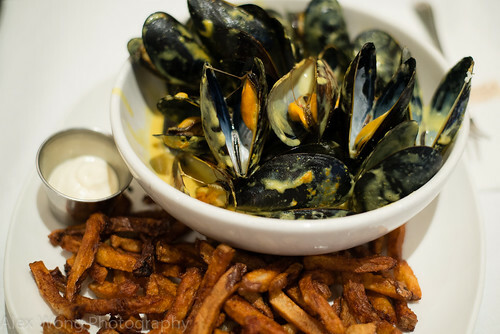 It is a great place for inexpensive French style food that my traveling partner and I are fond of, especially on our trips to this French Canadian city. 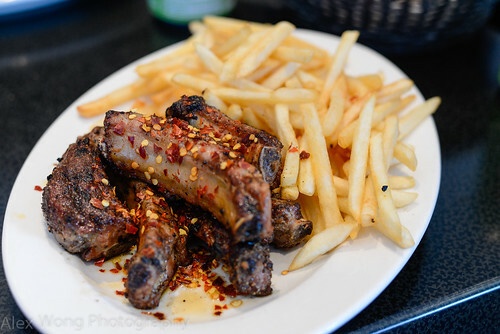 One year, we paid a visit to the downtown branch instead of the usual locale on Rue St. Denis, and we were greatly disappointed by inattentive cooking and burnt fries (even after sending it back). However, during a recent, my buddy managed to convince me to return to the original site, and boy, were we pleased by a sumptuous meal reminding us of our first few visits to this establishment. I was in a mood for Moules et Frites (Mussels and Fries) and that fix was very much taken care of here. The $13C special from Sunday to Wednesday sealed the deal, as well as the fine French Sauvignon Blanc from the wine store across the street. Plan to go early or after 8:30 as it gets rather crowded. 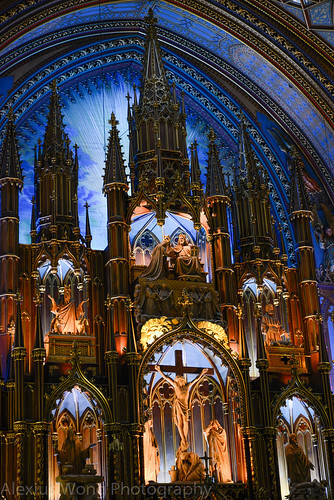 One of our favorite sights is Old Montreal, by the St. Lawrence River, specifically the Notre-Dame Cathedral. After a couple of hours marveling at the beautiful color-stained windows and lights that barely light up the massive house of prayer, we stopped by Les Glaceurs, an ice-cream and cupcake store. Although it is a local chain, it does not have that commercial feel. The ice-creams are well-made without being too sweet, offering a wide selection including sorbets. The cupcakes look very tempting, but the ice-cream seems to always do its job of satisfying the craving for something sweet while cooling us down. Don’t miss out on this small place located on the side of the cathedral when down by the Notre Dame. Not far from the Notre Dame is Chinatown located on the main Boulevard Saint Laurent. Many eating establishments in this area offer Vietnamese cuisine – some Vietnamese moved here due to their knowledge of French taught by their former colonialists. One simple eating establishment that we particularly enjoy is My Canh. My friend’s order of the Combo No. 1 (I’m always wary of anything combo) came with well-marinated grilled beef, chicken, grilled shrimp, along with Imperial roll, salad and rice, which he enjoyed tremendously. My order (Combo No. 2) was similar except mine consisted of lemongrass chicken filled with the root fragrance without being overwhelmed by it or too salty from fish sauce. The fish sauce dip to the tasty Imperial roll was the perfect balance of flavors. The opening clear pho soup was full of flavor and worth every sip. Note: only cash is accepted in this establishment. 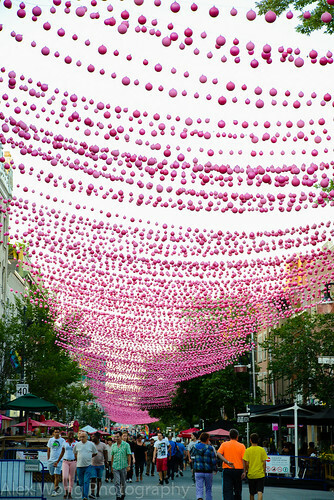 Bistro 1272 is located in the gay-friendly part of town, Le Village, where the main Rue Sainte Catherine is closed to pedestrians decorated with overhanging pink balls in mid-air during the warm months. Bumping into some friends there, we decided to join them for dinner. After perusing the menu, I decided to go with the night’s special. 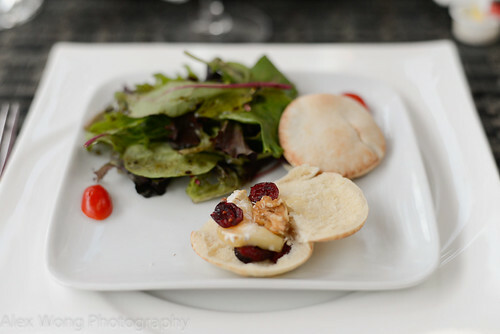 The entrée was pita bread filled with flavorful Brie cheese (not the American pasteurized crap) paired with sweet dried cranberries and toasted walnuts, creating a tasty balancing act of flavors. The order of Grilled Chicken in Mushroom Sauce took this cut of poultry to a good place. 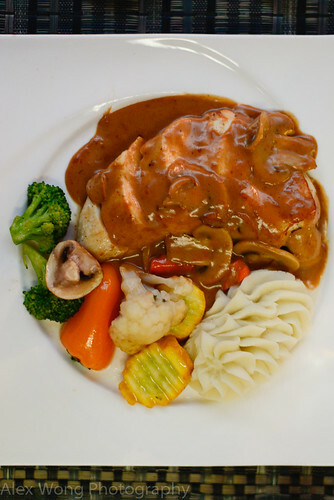 Moist chicken slices are smothered with a rich and slightly woodsy brown sauce that made it worthwhile mopping up with some bread; the sides of Pommes Purée and vegetables were also well-executed. My friend’s order of Seafood in Beurre Blanc was a revelation for him. 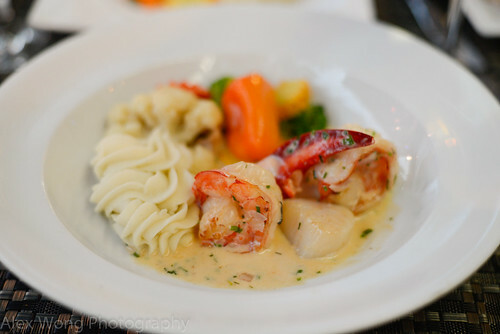 The pieces of shrimp, lobster, and scallop were bathed in a rich and flavorful shallot and lobster-infused butter sauce that made my friend effusive throughout his meal. You can find well-executed meals here at a very reasonable price, and it is worthwhile dining al fresco watching the pedestrians stroll by. A visit in 2016 revealed another wonderful Vietnamese restaurant through a Facebook friend living there. 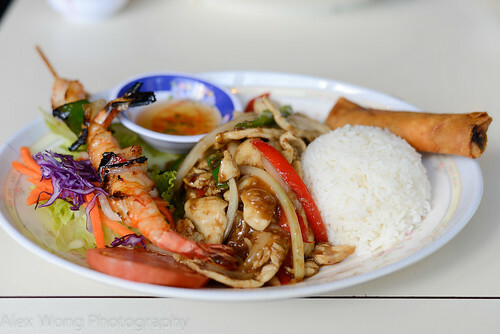 Located near the metro in the Côte-Des-Neiges neighborhood, Hoai Huong is frequented by the locals as well as many expats, which is a good sign of its cooking. And what a feast did we have there. 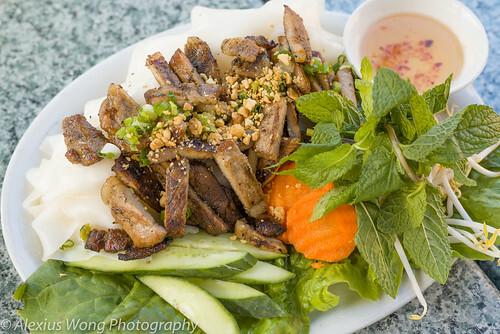 The Banh Dap Thit Nuong (#22) was a plate of well-marinated grilled pork served with wide noodles and shrimp crackers, which was a novel dish for me. 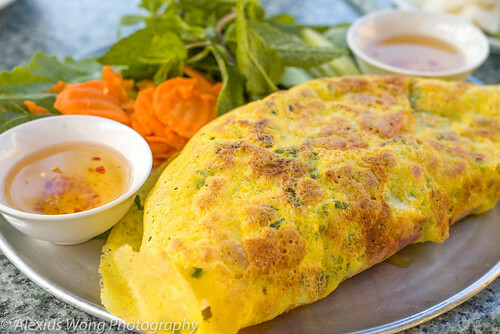 The Banh Xeo (#24) was properly made with the crêpe that maintained its smoky crispiness throughout the meal despite it being overstuffed with bean sprouts, pork slices, and shrimp. But it was Bo Ba Mon (#31) that got my full attention. 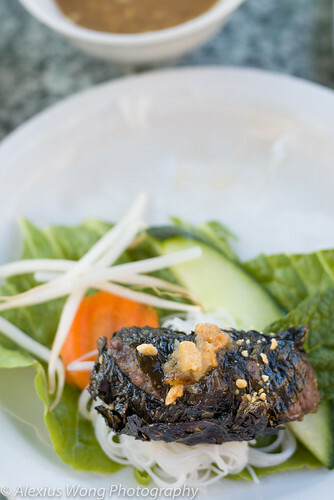 Three types of grilled beef sausages were presented with the accruements, all to be wrapped in rice paper and dipped in a heavenly sauce of crushed pineapple and anchovies. It is worth making a special trip to taste this cooking especially dining in their beautifully flower-adorned terrace. Maybe a trip to Oratoire St. Joseph nearby after a meal here would be the penance for such glorious dining. Ah, we can’t get enough of this charming city every time we visit it. Just when we thought we had calculated enough days for our trip, we always felt a few more would have made it perfect. With such great food, amiable friends and strangers, and wonderful street life and eating ambience, it is hard to press the stop button and come back to the daily grind. But such wonderful experiences only allow us to continue with our trying lives while looking forward to returning to this beautiful respite again and again. With such wonderful gastronomic offerings, Montreal seems to make that call continuously to us, louder each time. We’re coming back soon; don’t worry!